We have carved a niche for itself in the domestic and international markets as a manufacturer and supplier of Ceramic Pickle Jar. Our range of products include Ceramic Ceramic Pickle Container . Available in all size and diffrent shape. Store anything you want and let your room corner gain volume as well as an obvious presence with this ceramic jar with a airtight wooden lid. # Cardboard packets - 125, 250 & 500 gms. 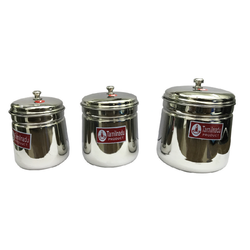 # Metal containers & Ceramic jars - 200 gms. # American pine hand carved chestlets - 100 & 250 gms. # Tea bags - 25 / 50 / 100 packing( IMA/Constanta& Maisa). We also custom pack for International packers. # Bulk Tea. Can also source Organic, Flavoured and Herbal tea. Jagadish & Associates Impex (P) Ltd.
Kitchenware items like this canister are always the best choices for people who appreciate both style and durability. This is made of glass withy ceramic airtight lid and comes in a transparent color. This makes for a handy buy if you want durable and appealing storage accessories.A perfect and modern way for storing spices. We are engaged in manufacturing Ceramic Pickle Jar. Which was made with premium Grade Clay.